On September 1, 2010, a new feature, popular with bingo patrons, started. Power Ball was added! Starting with that Wednesday’s games the night’s caller pulled a number prior to the start of the regular games. This would be known as the Power Ball. A $100 “pot” would be won by a player if their winning number for a game (other than the 50/50 games) was the Power Ball number of the night. Excitement grows when no one wins on the Power Ball for the night as $50 would be added to the pot for the next bingo night. 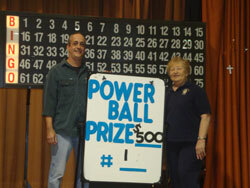 As luck is unpredictable, no one won on a Power Ball number and the pot grew to be $500, which is the limit. It stayed at $500 for twelve evenings of bingo until Wednesday, November 3, 2010. That evening a regular patron of our bingo games won on I 20, the Power Ball number of the evening. Congratulations to the winner and good luck to all players as the Power Ball pot will again start at $100 and grow until there is another winner.